Another month has come and gone, can you believe how fast time flies? Spring has officially started, however, mother nature has other plans in store for us. I don't know where you're located, but currently in Toronto, it is still cold, windy and we have temperatures in the negatives * sad panda *. Enough blabbering - here are my favorites for the month of March! Please be sure to share with me any favorites you have this month, I'd love to check them out! My skin has finally calmed down since its crazy breakout this past winter and I have been able to finally feel comfortable in my own skin again. With that being said, I have gone back to using the Giorgio Armani Luminous Silk Foundation with a peach-toned blush for spring, keeping it light and bringing out my inner glow. 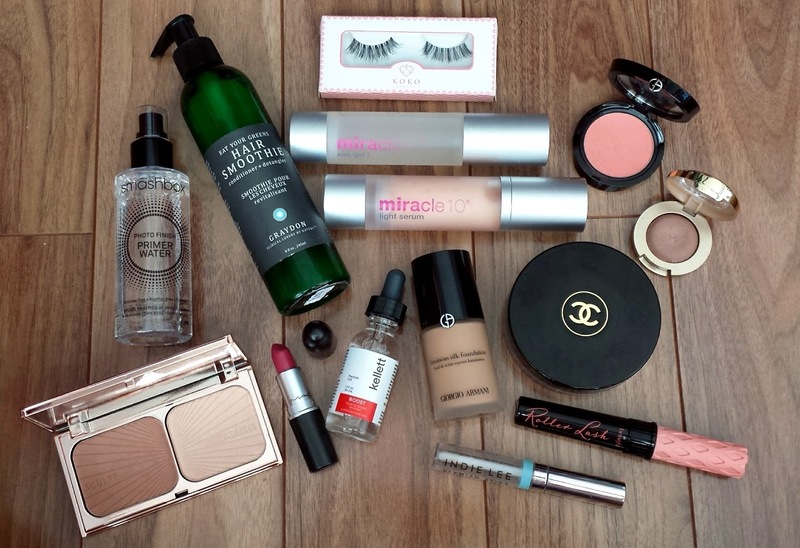 My favorites this month are centered around creating a more dewy, radiant glow - hence the bronzer, hilighter and such. I still love the Smashbox primer water, it boosts my hydration and creates a smooth base for makeup application - to fill in my pores, I use the Smashbox pore filler or the Too Faced Prime and Poreless. The skin favorites are what have got me through this past winter ... my ultimate favorite this month however has to be the Graydon Hair Smoothie. It has a blend of essential oils including brocolli seed oil, parsley, sage, rosemary and thyme. This green blend feels like nothing upon application, which is deceiving, however when water is mixed in, it becomes smooth and silky. This is light enough to be used directly on the scalp and it has helped with my hair growth. I unfortunately have really thin hair, and ever since I used this, my hair has been soft, shiny and a bunch of baby hairs come out. The scent of this product is very herbally and relaxing - I LOVE IT. I am ordering the 1L bottle once this is done! I got this a few weeks ago, and I've been using it religiously every day with my Lush Shampoo Bar. The combination together has helped lots. Until nxt time, XO - M.
What are your thoughts on Benefit's Roller Lash mascara? I've yet to try it, but I'd like to! Ouuuu, that hair smoothie sounds amazing! I wonder how it smells. Natalie - I did a full review with before and after pics of the Roller Lash mascara :) http://www.mirandaloves.com/2015/03/review-of-benefits-roller-lash-mascara.html Hope it helps!! it smells exactly as you think it will - kinda herbally.. kinda like the sage, rosemary type smells just bc those essential oils are in it. The hair smoothie sounds really cool! It's hard to find products that actually encourage hair growth!